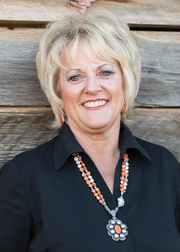 Cathy Buckmaster is a ranch raised cowgirl from Dupree, South Dakota. Cathy is the daughter of the late Cliff and Inga Birkeland, one of the premier Angus Breeders in the state of South Dakota. Her brother’s families continue to carry on the ranching tradition in Ziebach County. Cathy earned her bachelor’s degree in education from Black Hills State University, with a degree in business and education, one that has served her well in her business developments and real estate career. Cathy has a background in construction, having been a general contractor and builder of many of the finer homes in the Butte County area. Real Estate and Ranching are the blood that runs in her veins. She loves selling ranch property and being back in the country where life is very comfortable for her. Cathy was the Realtor of the Year in 2012 for the Mount Rushmore Association of Realtors and has served in various offices on the Board of Directors since beginning her career in 1999. Cathy was an Owner/Broker of her own company from 2005 - 2017. Cathy has earned her ABR (Accredited Buyer Representative), CRS (Certified Residential Specialist) and her GRI (Graduate Realtor Institute) degrees. Cathy has three adult children: daughter Marty and her husband Kurt Leibel and three sons Karsten, Kamryn and Kipton, of Marietta, GA, daughter Jaime and her husband Jason Fearing and children Taylor and Layne of Reedsburg, WI, and son Wayne Eaton and wife Tessa and children Ryan, Halle and Taiten of St. Onge, SD. Cathy’s passions are serving the Lord, enjoying her family and spending quality time with friends and family. Serving the Black Hills and Western South Dakota are Cathy’s premier areas. For all your Real Estate needs, call a seasoned veteran in the business who has always been one of the highest producers in the Northern Hills because of her hard work ethics and drive to help her clients buy and sell.